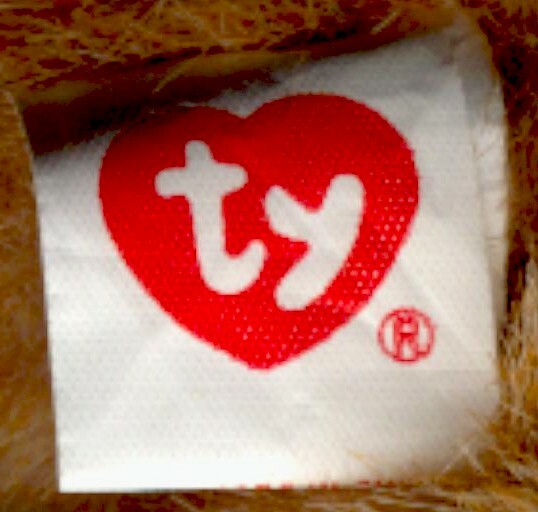 Front of tush tag has the red Ty heart and the registration symbol. Tush tag shown is from a fifth generation Pouncer. 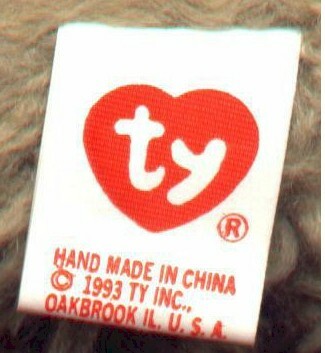 Back of tush tag reads "HANDMADE IN CHINA � 1993 TY INC., OAKBROOK IL. U.S.A. SURFACE WASHABLE ALL NEW MATERIAL POLYESTER FIBER REG. NO. PA-1965(KR) WITH SMALL C E.
Front of tag has the red Ty heart and the registration symbol and reads "HAND MADE IN CHINA." Tush shown is from a fifth generation Tracey. 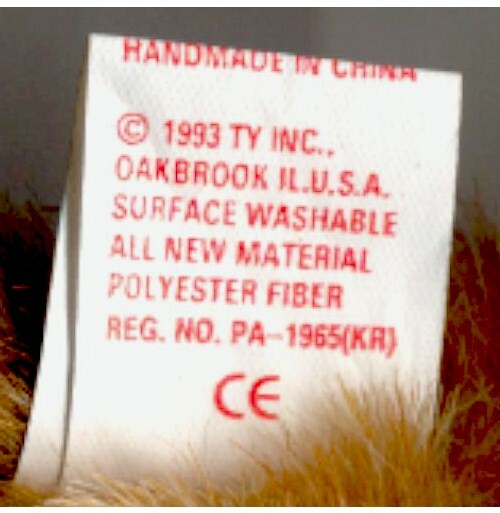 Back of tag reads " � 1993 TY INC. OAKBROOK IL U.S.A. SURFACE WASHABLE ALL NEW MATERIAL POLYESTER FIBER & P.V.C. PELLETS REG. 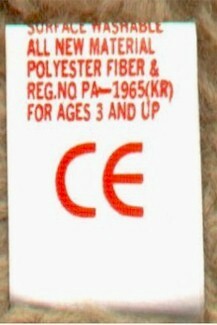 NO PA-1965(KR) FOR AGES 3 AND UP with the large CE. 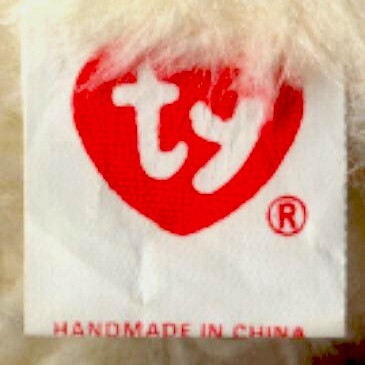 Front of tag has the red Ty heart and registration symbol and reads "HAND MADE IN CHINA." Tush shown is from a fifth generation Nola with dress and hat. 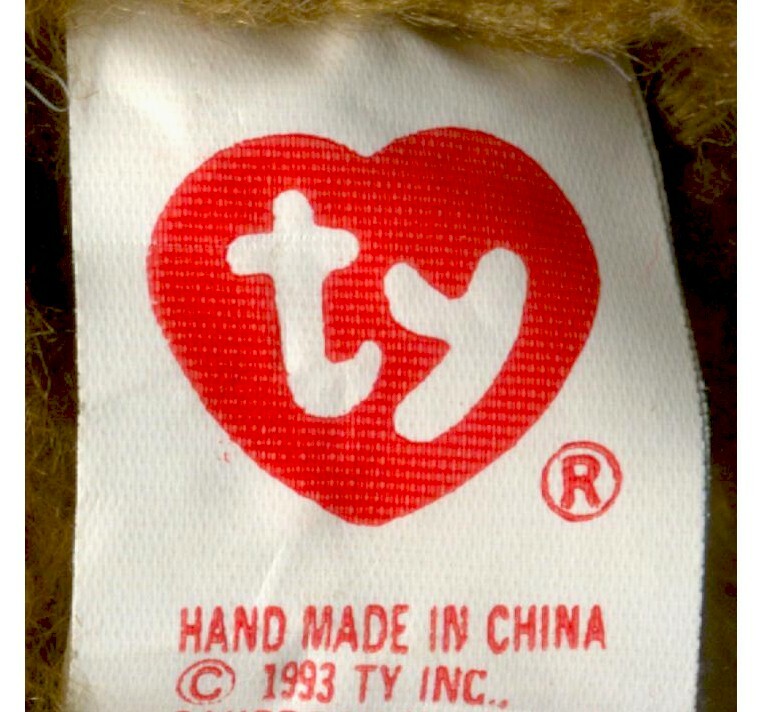 Back of tag reads " � 1993 TY INC., OAKBROOK IL. U.S.A. SURFACE WASHABLE ALL NEW MATERIAL POLYESTER FIBER & P.V.C. PELLETS REG. PA-1965(KR)" with small C E.
Front of tag has the red Ty heart and registration symbol and reads "HAND MADE IN CHINA." Tush shown is from a fourth generation Grover Gold. 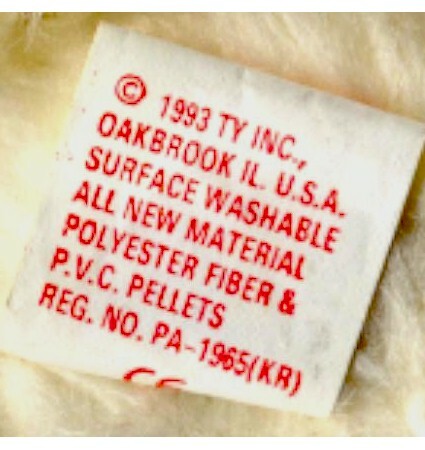 Back of tag reads " � 1993 TY INC., OAKBROOK IL. U.S.A. 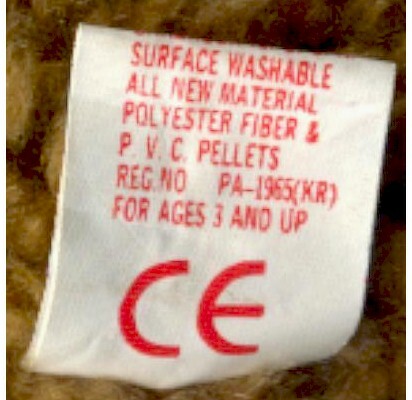 SURFACE WASHABLE ALL NEW MATERIAL POLYESTER FIBER & REG.No PA-1965(KR) FOR AGES 3 AND UP" with large C E.